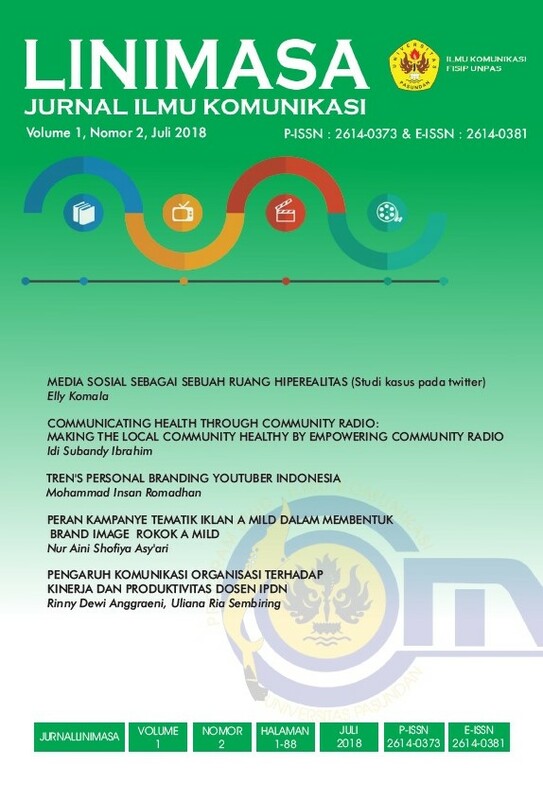 This article is about community radio in Indonesia, and highlighting the huge potentiality as a medium for health communication relevant with the context of local community. The main focus is to community radio stations in the region of Pantura, West Java. Through field observation and interview with the management of the community radios, this article shows the community radio’s strategy and operation to struggle in their daily local community activities. When traditional communities are dying destroyed by the excesses of free market liberalism, community radio becomes the space to maintain the sense of local closeness, and when liberalization in health can be seen to local levels, community radio promises spaces to share, to make dialog, that grows self-awareness and joint perception concerning local reality appears from inside the community itself. The involvement of community in the management and programs put forward the communal point of view, overcoming government’s point of view, which is very needed to deliver complexity of the programs and promotions related with community health issues in a language comprehensible by poor and low-educated communities. Theoretical discussions concerning health communication explain that the existence of community radios is supposed to encourage health intervention models to be more democratic and sensitive towards the communities. Therefore, in the efforts to make the heterogeneous Indonesian people healthy, the empowerment of community radios and health communication perspective with local culture basis are important agenda. SUBANDI IBRAHIM, Idi. Communicating Health Through Community Radio : Making the Local Community Healthy by Empowering Community Radio. LINIMASA: JURNAL ILMU KOMUNIKASI, [S.l. ], v. 1, n. 2, p. 22, july 2018. Available at: <http://journal.unpas.ac.id/index.php/linimasa/article/view/1079>. Date accessed: 22 apr. 2019. doi: http://dx.doi.org/10.23969/linimasa.v1i2.1079.